In this topic Louise demonstrates the strategies she uses when riding horses with a tendency to swap leads in front of the jump. She discusses the reasons some horses develop this habit and how to prevent it altogether. These are just some of the winning techniques that have made her a champion hunter rider for decades. Equine activities can be hazardous and may subject participants to injury. 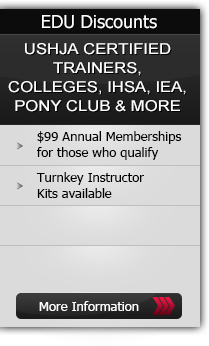 Neither Equestrian Coach, LLC nor Louise Serio assume liability for your activities. This program provides general instructions and techniques that may not be suitable for everyone. No warranty is given regarding suitability of these instructions to the viewer.